Tasteless Toddlers – Get Some Class! Oh the horror! A small child pretends to breastfeed a doll. Doesn’t this lower class, chav like scummy little creature know that nice little girls bottle feed their dolls? Doesn’t she know she is displaying every attribute of being a crude little attention seeking backstreet floozy? Doesn’t she know it’s not normal? It’s depraved and disgusting. Before you know where we are, she’s going to grow up and do it for real. Quick, get a pot of paint and paint out this obscene image. Report her family to child protection services. Get this child a plastic bottle with white fluid in it! Stat!. Alternatively, email or write IMMEDIATELY to the Pennine Acute Hospitals Trust and tell them how wonderful this image is, and how responsible of them it was for them to have it on their walls during National Bash Breastfeeding Week. Who knows, if we let them know how good it is, they may actually produce an official one for next year. This one was simply made for the notice board, for that week. Do not put it off until later. Do not do it tomorrow. They are in the middle of a media storm RIGHT NOW, and the people who put this lovely little snap shot poster together, need to know you are rooting for them. They need to know they are not going to get sacked/banned, all official materials censored and checked for ‘content’ every time they press print on the printer…and they are not going to be shunned in the canteen… and that what they did was thoughtful, inspiring and lovely. They need your support: now. This is the reality of lactaphobia people – when toddlers are told off for putting a doll under their shirt. This is why women get ordered out of cafes. Because breastfeeding is low class, scummy, cheap, tacky and crude. And it’s shocking that a child is pretending to do such a tasteless thing. 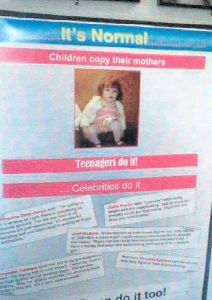 Contact them now: spread the word – support this poster, this child and her mother. Tell the world that this is actually the normal behaviour. Three minutes effort to make a difference. How often do you get that chance? Speak Up. Speak Out. Speak True. An unexpected finding of this study was how common it was for children to role-play breastfeeding in games in which they sometimes showed a high level of knowledge of breastfeeding. Role-play is recognised as a type of learning in which children imitate people around them in preparation for future roles (Edwards, 2000). Breastfeeding role-play has previously been reported in cultural contexts where breastfeeding is common (e.g. Goldman & Smith, 1998) and it is sometimes valued as important preparation for mothering. Thus, anthropological research in northern Australia described how young aboriginal girls practiced breastfeeding via the use of clay ‘dolls’ and ‘breasts’ as a part of their formal learning (Thomson, 1983). Similarly, in parts of Africa, dolls are considered ‘educational toys’ to be used by young girls to practice baby-care, including feeding (Roy, 1981). Interestingly, dolls are commonly used as a learning tool in antenatal classes inwhich positioning of a baby doll at the breast is considered a type of performance accomplishment aimed at increasing post-natal maternal confidence (Noel-Weiss, Bassett, & Cragg, 2006). A lack of experience and knowledge of breastfeeding prior to birth has been identified as contributing to breastfeeding difficulties and early weaning (Dykes & Williams, 1999; Hill & Aldag, 1991). However, this study demonstrated that learning about breastfeeding can begin in childhood and that children are capable of acquiring valuable information about breastfeeding though observation, discussion and role-play. It can be hypothesised that the embodied knowledge resulting from girls regularly seeing breastfeeding, talking about breastfeeding and playing breastfeeding games may assist them to breastfeed in adulthood. The high level of knowledge about breastfeeding that some of the children in this study demonstrated is in contrast to previous research in which children were found to have little knowledge of breastfeeding and to consider bottle feeding as the default way to feed a baby (Russell et al., 2004). It is clear that children develop an understanding of what is normal with regards infant feeding by observing what they see around them. Thus, if children predominantly observe babies being bottle fed, they develop an understanding that babies are normally bottle fed. Television and children’s picture books could play an important educative role in this area; however, rather than normalising breastfeeding, these mediums commonly present bottle feeding as ordinary and breastfeeding as problematic (Altshuler, 1995; Henderson, 1999; Henderson, Kitzinger, & Green, 2000). 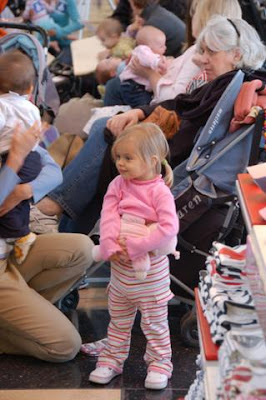 Further, children are encouraged to practice bottle feeding by the almost universal provision of bottles with baby dolls. Thus, even in an environment where breastfeeding is common, children may bottle feed rather than breastfeed their dolls (Nakamura, Veiga, Ferrarese, & Martinez, 2003). Since children can learn significant information about breastfeeding through breastfeeding role-play, it is logical to consider whether bottle feeding play may similarly educate children about bottle feeding and, if so, whether this is a problem. There has been no research carried out in this area. However, it can be surmised that bottle feeding role-play could assist children in learning how to hold a baby while bottle feeding, that infant satisfaction is gained by provision of a visually measured amount of milk and that bottle feeding is normal. Such learning could be harmful. Previous experience with bottle feeding negatively impacts the ability of mothers to breastfeed. This is because mothers attempt to transfer knowledge they have gathered about bottle feeding to breastfeeding (Mohrbacher & Kendall-Tackett, 2005; Renfrew, Fisher, & Arms, 2004). This can cause decreased maternal confidence in breastfeeding, physical difficulties with breastfeeding, low milk supply and misinterpretation of infant behaviour in ways that increase the likelihood of weaning (Bailey, Pain, & Aarvold, 2004; Hoddinott & Pill, 1999; Mohrbacher & Kendall-Tackett, 2005; Righard, 1998). Familiarity with bottle feeding over breastfeeding also makes bottle feeding the default form of feeding and so if mothers experience breastfeeding challenges, they more quickly revert to the type of feeding with which they are comfortable (Bailey et al., 2004). In addition, bottle feeding play may create the expectancy of bottle feeding. Research has found that modelling of adult activities in play can encourage acceptance of the modelled behaviour as normal and desirable and increase the uptake of that behaviour in adulthood (Dalton et al., 2005; Klein et al., 1992; Klein & St Clair, 2000). This may apply to bottle feeding as a modelled behaviour. Clearly more research in this area is required. Done – Thanks for sharing Morgan. This is yet another story that makes me wonder just what goes on in the minds of some people – how ridiculous can you get?I often had to breastfeed a baby panda, and expect this will all come again soon too when the new baby arrives. My son at 2 years understood that daddy’s don’t breastfeed – so he used to express in to a cup for his dolls!I’ve emailed via the link provided Morgan, thank you for making it easy for me. Such posters should be applauded, not shot down. Ugg! I LOVE it when the kids care for their ‘babies’ in the same way I care for them and their siblings. I can’t belive the gull of people! I am British but living in Toronto, Canada and I have just sent off my email praising the campaign! I have breastfed both my sons until nearly 3 years old and they have both “nursed” their toys and were both disappointed when they found out that only Mummys can breastfed lolBreastfeeding needs to be normalised in society once again and posters like this are part of how that normalisation will occur! Thanks so much for sharing Morgan. Below is from a paper of mine. In three parts so it's acceptedKarleenAn unexpected finding of this study was how common it was for children to role-play breastfeedingin games in which they sometimes showed a high level of knowledge of breastfeeding.Role-play is recognised as a type of learning in which children imitate people around them inpreparation for future roles (Edwards, 2000). Breastfeeding role-play has previously been reportedin cultural contexts where breastfeeding is common (e.g. Goldman & Smith, 1998) and it is sometimesvalued as important preparation for mothering. Thus, anthropological research in northernAustralia described how young aboriginal girls practiced breastfeeding via the use of clay ‘dolls’and ‘breasts’ as a part of their formal learning (Thomson, 1983). Similarly, in parts of Africa, dollsare considered ‘educational toys’ to be used by young girls to practice baby-care, including feeding(Roy, 1981). Interestingly, dolls are commonly used as a learning tool in antenatal classes inwhich positioning of a baby doll at the breast is considered a type of performance accomplishmentaimed at increasing post-natal maternal confidence (Noel-Weiss, Bassett, & Cragg, 2006). A lack of experience and knowledge of breastfeeding prior to birth has been identified ascontributing to breastfeeding difficulties and early weaning (Dykes & Williams, 1999; Hill &Aldag, 1991). However, this study demonstrated that learning about breastfeeding can begin inchildhood and that children are capable of acquiring valuable information about breastfeedingthough observation, discussion and role-play. It can be hypothesised that the embodied knowledgeresulting from girls regularly seeing breastfeeding, talking about breastfeeding and playing breastfeedinggames may assist them to breastfeed in adulthood.The high level of knowledge about breastfeeding that some of the children in this study demonstratedis in contrast to previous research in which children were found to have little knowledgeof breastfeeding and to consider bottle feeding as the default way to feed a baby (Russell et al.,2004). It is clear that children develop an understanding of what is normal with regards infant feedingby observing what they see around them. Thus, if children predominantly observe babies beingbottle fed, they develop an understanding that babies are normally bottle fed. Television and children’spicture books could play an important educative role in this area; however, rather thannormalising breastfeeding, these mediums commonly present bottle feeding as ordinary andbreastfeeding as problematic (Altshuler, 1995; Henderson, 1999; Henderson, Kitzinger, & Green,2000). Further, children are encouraged to practice bottle feeding by the almost universal provisionof bottles with baby dolls. Thus, even in an environment where breastfeeding is common, childrenmay bottle feed rather than breastfeed their dolls (Nakamura, Veiga, Ferrarese, & Martinez, 2003). Since children can learn significant information about breastfeeding through breastfeedingrole-play, it is logical to consider whether bottle feeding play may similarly educate childrenabout bottle feeding and, if so, whether this is a problem. There has been no research carried outin this area. However, it can be surmised that bottle feeding role-play could assist children inlearning how to hold a baby while bottle feeding, that infant satisfaction is gained by provisionof a visually measured amount of milk and that bottle feeding is normal. Such learning could beharmful. Previous experience with bottle feeding negatively impacts the ability of mothers to breastfeed. This is because mothers attempt to transfer knowledge they have gathered about bottlefeeding to breastfeeding (Mohrbacher & Kendall-Tackett, 2005; Renfrew, Fisher, & Arms,2004). This can cause decreased maternal confidence in breastfeeding, physical difficulties withbreastfeeding, low milk supply and misinterpretation of infant behaviour in ways that increase thelikelihood of weaning (Bailey, Pain, & Aarvold, 2004; Hoddinott & Pill, 1999; Mohrbacher &Kendall-Tackett, 2005; Righard, 1998). Familiarity with bottle feeding over breastfeeding alsomakes bottle feeding the default form of feeding and so if mothers experience breastfeedingchallenges, they more quickly revert to the type of feeding with which they are comfortable(Bailey et al., 2004). In addition, bottle feeding play may create the expectancy of bottle feeding.Research has found that modelling of adult activities in play can encourage acceptance of themodelled behaviour as normal and desirable and increase the uptake of that behaviour inadulthood (Dalton et al., 2005; Klein et al., 1992; Klein & St Clair, 2000). This may apply tobottle feeding as a modelled behaviour. Clearly more research in this area is required. I sent a comment to them, said it would be nice if more little girls did this instead of using the bottles the dollys come with, then maybe they’d be more likely to feed their babies when the time comes. The government birth – 5 pack seems quick to tell me children “learn through play” (so much so they’ve built the whole reception year curriculum around it) and that role playing and mimicking of normal every day behaviour is an important part of development.What is so out there about a child therefore copying the normal way to feed an infant, rather than the artificial risk increasing way? How weird society finds this freaky, yet dolls that scream for white plastic bottles perfectly ok.